Surprise your eyes with Snow Frills Daffodils. 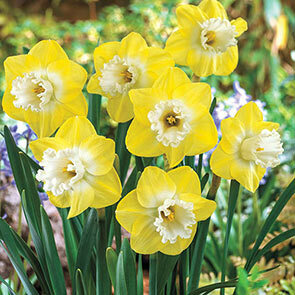 These unique blooms have the reverse colouration of most bi-coloured daffodils; they present lemony yellow petals surrounding a bright white corona. Very sturdy plants, Snow Frills are prepared to handle inclement weather and can stand up to strong winds and rain. Early to mid spring bloomers, these 16- to 18-inch tall flowers will light up your landscape with their bright colours and heavily frilled cups. Snow Frills daffodils (Narcissus large cupped 'Snow Frills') are hardy in zones 3 through 8. 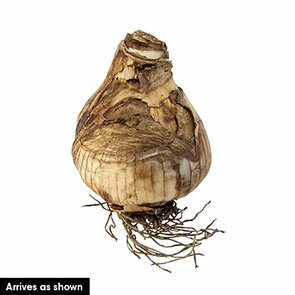 These white and yellow daffodil bulbs prefer full to partial sun and well-drained sandy, loamy or clay soils. Plant your bulbs in the fall, approximately 6 inches deep and spaced 4 to 6 inches apart for optimal growth. These cheerful perennials naturalize easily, and will begin to spread and multiply in their second or third year of growth. Like most Narcissus Daffodils, Snow Frills are excellent for filling large areas with swaths of spring colour. Naturalize them along tree lines, on hillsides, at roadside edges and around lawn borders for patches of sunny hues. Pair these white-on-yellow daffodil bulbs with their yellow-on-white counterparts for a dazzling display, or blend them with a variety of spring bulbs for an extravaganza of colour. Unique reversed colouration for a garden that wows! We love the unusual palette these fragrant flowers bring to the landscape. They open in early spring with pale, buttery yellow perianths and creamy white, heavily ruffled cups. Snow Frills is a sturdy variety that withstands the spring weather with ease. Plant them in groups for a stunning display of colour in seasonal borders or mixed bulb gardens. They naturalize beautifully, reliably returning year after year. Ideal for cut-flower bouquets, too.